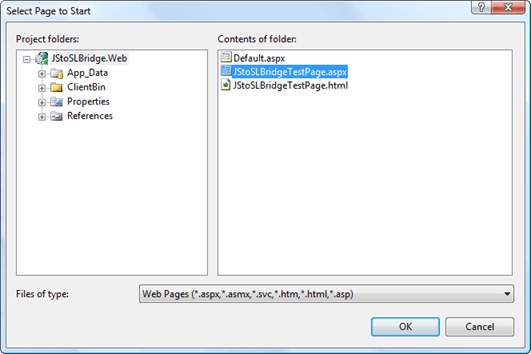 The basic idea is to have two TextBox controls, one defined in ASP.NET and the other in the Silverlight control. The former will accept user input. The latter will spit it back out (but with formatting tags specified by the user applied to the text; that functionality will be part of my next post on this project). 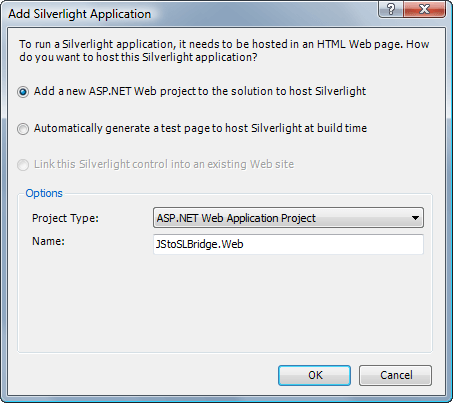 To start, you’ll need a basic Silverlight project (or, alternatively, you could just download the source linked at the bottom of this post). 1.) 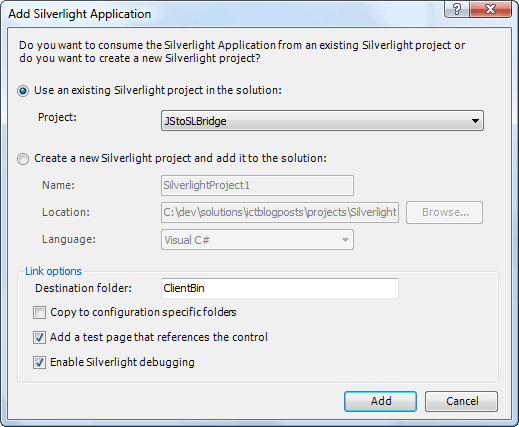 Create a new Silverlight project. I called mine “JStoSLBridge”. 2.) 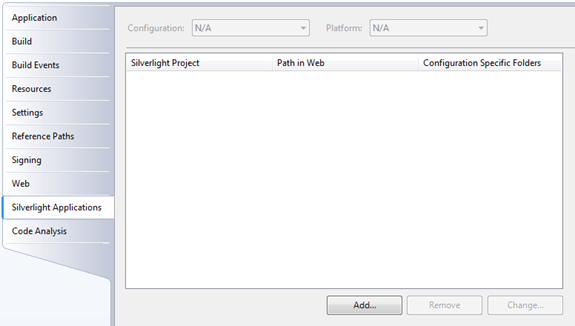 As a further setup step, add the Silverlight project as a Silverlight Application in the web application. You can leave the default settings and click “Add”. 3: <%@ Register Assembly="System.Web.Silverlight" Namespace="System.Web.UI.SilverlightControls"
In this function, we get a reference to the Silverlight control and also the text value of the TextBox control. 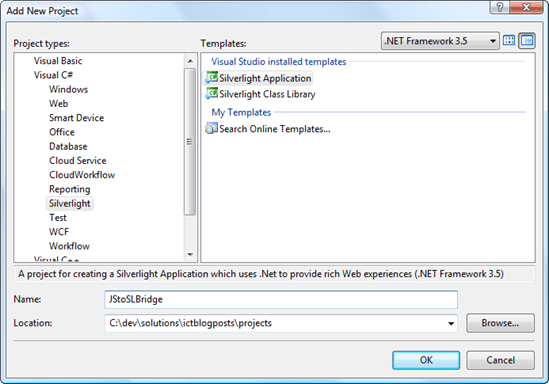 We then pass in that TextBox value into the Silverlight control via the “JStoSLBridge” object which we’ll define inside the Silverlight control itself (see below). I made the TextBox read-only by specifying IsReadOnly=”True”. I did this simply because I want the text to flow from the ASP.NET TextBox to the Silverlight TextBox, and don’t really want the user modifying the Silverlight TextBox directly. ScriptableMember is part of the System.Windows.Browser namespace, so you’ll need to add a using statement at the top of the code file. Since I just want the single method exposed, though, I’ll stick with the former approach. That’s it. Run and test. Of course, make sure you’re running the correct page and that the ASP.NET web project is set as the startup project.